There it is, through the grey Beijing dust and smog, Steven Holl’s “Linked Hybrid.” Housing for Chinese, or anyone, who can drop about a million bucks on a place in the Chinese capitol. Through the construction gate you see a typical Chinese construction site. Teeming with activity, messy, dusty, and a combination of the latest technologies and underpaid, (very) manual laborers. They often live on or near the site. In cramped, and worse conditions. The developer will pay a penalty if many units are not ready for people to move in in two months! Hire more low-paid workers. Holl’s office says the units will be ready. The colors are going up in the window frames. That’ll look good even from the highway – look for “Linked Hybrid” when you drive in from Beijing airport – it’s on your right, about three-quarters of the way into town. Beijing’s smog makes everything look dirty quickly, but Holl’s office says these panels will be washed frequently, and automatically. The colors, he says, are based on the bright yellows and reds and blues at Chinese temples- (do watch this video. of Steven Holl talking about this project. It’s really great.) -such as the newly repainted for Olympic visitors Temple of Heaven in Beijing. The palette may be based on those temples, but it also bears strong resemblance to a previous Holl project, one I very much admire, Simmons Hall, a dormitory at the Massachusetts Institute of Technology. Still, the colors should look nice and open and close and change and merge as you move past the building on bicycle, or more likely for now until China comes to its senses- by car. The skybridges are supposed to be for the public. With cafes, a pool, etc. I wonder how long public accessibility will last there, in this project for the wealthy? When Holl was given the project, he was told to design for a previous scheme of eight towers, eight being lucky for the Chinese. He added the skybridges. His office says they showed the Chinese developers their designs and expected some “dumbing-down” or cost-cutting, instead they were told that construction would start quickly, and if Holl could make his moves any more radical to go ahead and do so. China – the land of ‘anything goes.’ Also in this high-end multi-use project are cinemas, a Montessori school, public parks, and more. Steven Holl already has more work in China, bigger projects than this one. Four of his are planned to open between now and 2010. The mixed-use “Linked Hybrid” in Beijing, “Chengdu Project” in Sichuan, and “Vanke Center” in Shenzen (near Hong Kong), and the Nanjing Museum of Art & Architecture. And he’s gone green in the land of grey air. He incorporates green roofs, natural light, high-performance glass, energy-efficient technologies, geothermal energy and large ponds to harvest recycled rainwater. Grasses and lily pads create a natural cooling effect. But don’t count on the wealthy residents using much natural ventilation since the Beijing air is so bad- polluted, dusty, windy, hot and cold. What more could you ask for? While I think these projects are exciting, and I applaud the green features, it must be said that China ought to preserve more of its traditional housing forms. The lower, courtyard buildings. Some preservation is going on, but more could be saved rather than all the bulldozing of them that I see. The remaining ones should be renovated. And then, some new, profitable, grand-scale model for housing is needed, rather than towers; something closer to traditional Chinese life. proud of his original tile floor. “Why would you take anyone into this dump?” his wife scolded him. While not romanticizing, I think I’d rather look out from their terrace than out a window at “Linked Hybrid,” even onto the planted roofs than Holl’s firm is designing. Clearly Steven Holl is putting a lot more art into his project than you find in most of what’s going up in China. As usual, it’s not the “starchitects” we should criticize, but the Banal Builders. In the end, we are like cockroachs. We adapt. A man, on that same overpass. Would he wish to trade places with his kite? Will the people who inhabit the new tower blocks of China alter them to make them more hospitable? Looks like they’re designing a Steven Holl project, doesn’t it? For today’s Chinese, Holl’s project may be the new “Temple of Heaven.” I’m curious to see the backlash, as China continues on its riotous run. sky. Yet this exhilaration also comes at a price: only the wealthiest of Beijing’s residents can afford to live here. Climbing to the top of one of Holl’s towers, I looked out through a haze of smog at the acres of luxury-housing towers that surround his own, the kind of alienating subdivisions that are so often cited as a symptom of the city’s unbridled, dehumanizing development. Protected by armed guards, these residential high-rises stood on what was until quite recently a working-class neighborhood, even though the poor quality of their construction makes them seem decades old. Nearby, a new freeway cut through the neighborhood, further disfiguring an area that, however modest, was once bursting with life. 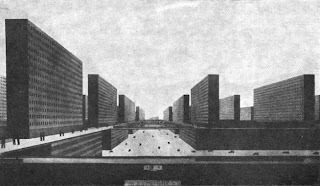 If you take Venturi’s ideas about the city,” Holl said, referring to Robert Venturi’s groundbreaking work, “Learning From Las Vegas,” which called on architects to reconsider the importance of the everyday (strip malls, billboards, storefronts), “and put them in Beijing or Tokyo, they don’t hold any water at all. When you get into this scale, the rules have to be rewritten. The density is so incredible.” Because of this density, cities like Beijing have few of the features we associate with a traditional metropolis. They do not radiate from a historic center as Paris and New York do. Instead, their vast size means that they function primarily as a series of decentralized neighborhoods, something closer in spirit to Los Angeles. The breathtaking speed of their construction means that they usually lack the layers — the mix of architectural styles and intricately related social strata — that give a city its complexity and from which architects have typically drawn inspiration. You are currently browsing the archives for the Linked Hybrid category.